When you first meet with a qualified professional from Rock Solid Construction Inc., our primary goal is to come up with a plan that will suit your unique needs and preferences without completely draining your bank account. From that point on, we will stay in communication with you every step of the way, and will always keep your vision in mind. Because we are a local business, you can also trust us to treat your property and family with the utmost respect. Whether you are adding on a new guest wing, finally expanding your kitchen or building an entire new second floor, the team at Rock Solid Construction Inc. can handle any home addition job you send our way. Our team has over 40 years in the contracting industry, and we use that strong depth of knowledge to ensure an excellent finished product every time. If you’re extending your family or are just looking to add to your home, Rock Solid Construction can help you add that home addition you’ve been dreaming of. Our home remodeling contracting services run the gamut from A-Z. We can help you design the addition, whether it be a bathroom, bedroom, or a completely new building. Our expert builders will be able to lay a solid foundation to guarantee your addition will be long-lasting and durable, and our professional team will make sure to build your addition exactly how you envision it. 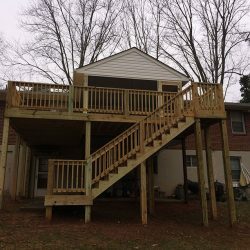 If you are in need of a business that has a proven track record of building versatile, comprehensive and stylish house additions in Lynchburg, VA, then you need look no further than Rock Solid Construction Inc. To learn more about our services, please give our team a call at 434-316-3499, or visit our contact us page.